We were very disturbed to hear that on Mon 16th Sept a number of emergency vehicles – including the ambulance service – were unable to gain entry to the site – eventually having to climb into the site and break in with bolt-cutters to get to a person who needed assistance. Apparently, some time between the hours of 8 and 9pm that evening, two dog-walkers found a person who needed help on the Local Nature Reserve and raised the alarm. Local residents were amazed to see a convoy of emergency vehicles – including the ambulance service – turn up at the main entrance to the Craighouse site, only to find they could not gain entry. 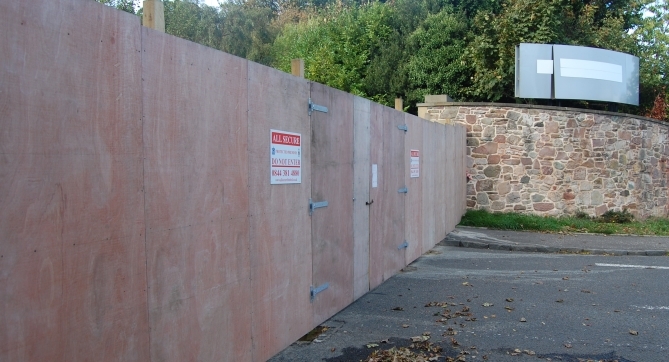 The entrance has been blocked by the Craighouse Partnership by 7 foot plywood hoardings and Do Not Enter signs (despite the fact that the site is still open to the public). After phoning for entry and waiting, the emergency team had to eventually cut their way in with bolt cutters and climb over the hoardings to allow the emergency vehicles to gain entry. This has disturbed a number of residents. Local people have been writing to us to urge that this barricade be removed. It is ugly, it is intimidating and it reduces visibility of and from the site and now it has prevented the emergency services getting quick access to a person in need. This incident epitomises many of our concerns about what has been happening at Craighouse – and underlines the real importance of the community, regular community use and access when it comes to security and looking after the site. It is the community that noticed water running down the buildings and moved to get it stopped. It is the community that have pushed for the site to be maintained, it is the community who are regularly taking litter off the site and it is members of the community who helped a person in trouble and did their public duty. In a letter from July he stated that “youths” had been “driving recklessly around the site at speed” and that The Craighouse Partnership made “no apology for putting safety first”. In a letter from August, I was accused of not taking seriously the safety of the security guards. However, rather than putting safety first, the incident on the 16th shows the barricade prevented emergency services getting quickly and easily to someone in need. The Friends care about everyone using the site along with the security of the site itself – which is why we think that the hoardings at the entrance are not working and must be looked at again. 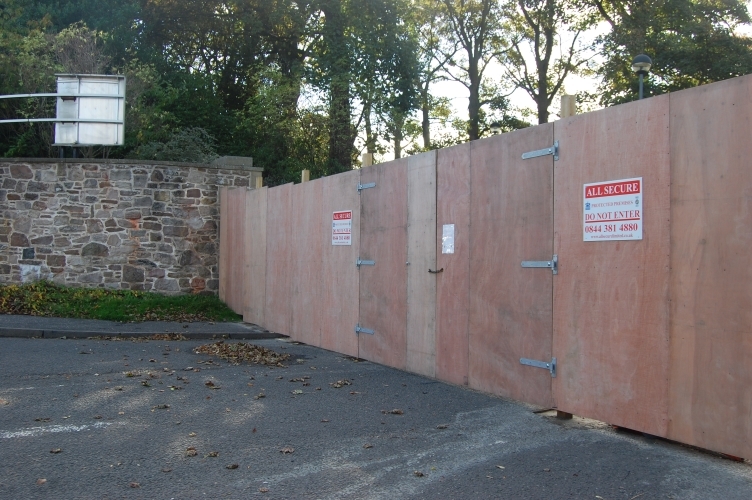 The hoardings that have been erected by The Craighouse Partnership prevent visibility from local houses and the road and reduce easy pedestrian access in and out of the site. They should be replaced with a measure that retains proper pedestrian access – as there has been for decades – and that allows good visibility into and out of the site and better emergency access. The old entrance system, if used properly, should have been adequate to prevent the kinds of incidents outlined by William Gray Muir, without blocking off pedestrian access and visibility to the site. We believe that encouraging regular community use, keeping the site cared for and maintained and making sure the site is highly visible discourages vandals and is better for everyone – the public, the security guards and the site itself. The site may be left in this state for a long period of time. If emergency vehicles cannot gain quick access, this is just not acceptable and could also increase potential risks in the case of fire. It is clear from this incident that the present set-up is not acceptable and that the hoardings are causing more risk than they are preventing. Another solution must be found. The hoardings must be taken down and the entrance must be properly accessible to pedestrians and – importantly – allow for visibility, as it has done previously, so that the community can continue to use and look out for this very special site – as they have done, very successfully, for decades under Napier’s ownership. Interesting point…it is after all over 6 feet high, very ugly as you say, in a conservation area and an impediment to emergency access to the site. You should see the hoops that normally have to be jumped through when negotiating new road layouts to preserve the ability of fire engines (and bin lorries) to access sites. Compare this to the difficulty folks have in erecting a small shelter for their bikes and I think it is really disgraceful that this fence is in situ. this sounds similar tactics to what Mountgrange and CEC employed at Caltongate, close up buildings and limit community access, then buildings can quietly rot away through neglect. Canongate Venture has suffered from serious neglect and criminal damage by the owners (CEC) on the basis that a land deal gives legal control to developers who havent paid a penny in rent or rates for the buildings they have sterilized! Surely the route now blocked is a public right of way? Try contacting http://www.scotways.com/ for some help. well they haven’t actually blocked the route to pedestrians, there are alternative entrances. And I’m not sure it is an actual right of way, although access rights do apply across the site except for the actual curtilages of the buildings.. I have emailed CEC planners today to ask if they intend to take any enforcement action, and if not to give their reasons for that. which states at page 23 that the entrance currently blocked off is one of two asserted rights of way in the Conservation Area. If emergency vehicles cannot access the site quickly & efficiently then there is a problem. Also the site is no longer accessible to wheelchair users. Access rights have been blocked for some people. The area that is blocked off with the massive gate was the best way to get in for wheelchair users and their carers, and afforded a smooth transition following on the pavement up in the southerly direction to see the spectacular views. I am aware of this document and I think the asserted Right of Way begins at the gate opposite the end of Craighouse Gardens and goes west from there towards the pond. But it is the case that the erection of this barricade does interfere with the ability of some folks to enjoy thier statutory access rights, and this could be unlawful (depending on whether stopping enjoymet of access rights was the main rewson and whether or not reasonable other arrangements have been made to to allow access). However even if this was thought to be the case they might just insert a gate rather than remoce the ugly whole barricade. Has anyone raised this with the Access Officer?